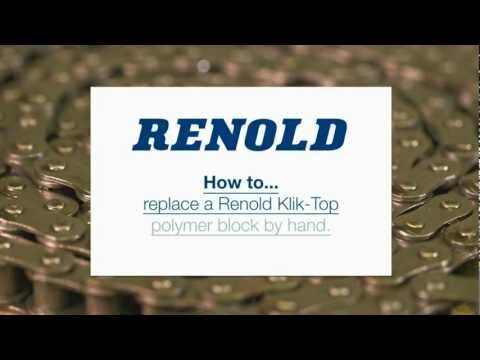 Renold Klik-Top Chain is quick to install, strong and suitable for transporting delicate goods without damaging them. The use of conventional transfer chains, chains with U-Type attachments and polymer block chains often results in damage to the chain. Whilst the replacement of just a single steel U-type attachment requires the disassembling of several chain components, Klik-Top chain delivers the easy solution. The clip is fixed onto the chain with a simple click. It attaches easily over the slightly extended pins of the chain. The clip can be removed from the base chain as easily as it is attached so that complex and expensive dis-assembly of several chain components is no longer necessary. Thanks to the approved and reliable Klik-Top mechanism you can replace a clip within just a few moments and production can continue. Furthermore a differently coloured clip marks the position of every connecting link helping you to locate them more quickly. Unlike conventional steel U-type attachments, there are no sharp edges in contact with the conveyed goods. Klik-Top features a synthetic U-Type attachment with rounded edges. When the chain passes over the sprocket the rounded edges of the new clip ensure that the goods will not be damaged. This also provides protection for the chain itself. Fitting over the slightly extended pins the clip secures the chain's bearing areas from dirt and other contamination helping to extend the chain's working life. Another benefit of the clip is that it can be combined with a multitude of base chains. Beside the approved Renold precision roller chains it can also be used on plated, coated or stainless steel roller chains for applications that require corrosion resistance. Renold Syno maintenance free chain can also be used for the base chain.